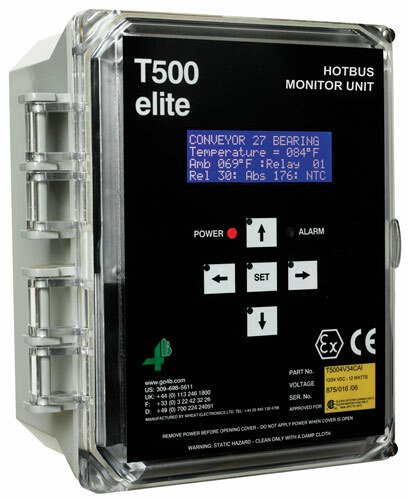 The T500 Elite Hotbus™ is a serial communications system designed to monitor up to 256 sensors for combined belt alignment, belt speed, continuous bearing temperature, pulley alignment, level indication (bin / silo) and plug conditions on bucket elevators and conveyors. With automatic machine shutdown capability and PLC / PC compatibility, this advanced microprocessor based system offers low cost installation, versatility and easy system expansion. Logging and trending software is also available for historic data analysis and preventative or predictive machine maintenance. The F500 is a communications gateway that allows for single point access to a maximum of four T500 Elite Hotbus™ systems via a Fieldbus protocol. 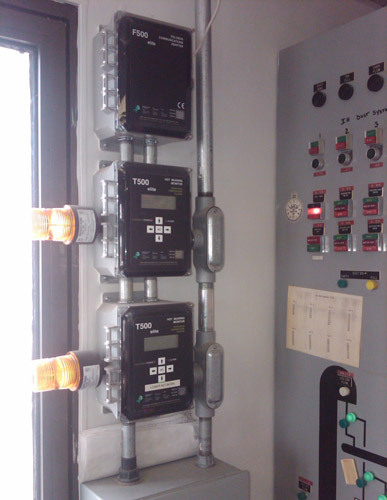 Fieldbus communication protocols supported include: Ethernet IP, Modbus TCP, Modbus RTU, DeviceNet, Profibus and others. The R500 is a microprocessor-controlled unit, which accepts signals from the T500 Elite Hotbus™ monitor, and is able to cause alarm or shutdown of equipment when a sensor exceeds its programmed alarm tolerance. The TN4 is a four input sensor node, powered by 24 VDC. Each input can be an NTC thermistor, PTC thermistor or Volt-Free Contact input; the types may be interchanged on a single node. The Node has a unique 4 digit address which is used to communicate to the T500 via a two wire serial RS485 connection. The TN4 Node processes information from electrical inputs into network data inputs for WDB, Binswitch or Touchswitch. The SN2 is a two input speed node, powered by 24 VDC. The node is able to monitor two independent pulse (speed) sources for dangerous under speed conditions. The SN2 will support pulses which are PNP or sourced. The Node has a unique 4 digit address which is used to communicate to the T500 via a two wire RS485 connection. The SN2 processes information from electrical inputs into network data. The data is passed down the network whilst local relays are activated for shutdown / alarm procedures. The Hotbus Node Tester is a portable testing unit that can be used in the field to determine the operational status of any Hotbus communications node and network to quickly identify wiring or node issues. Simply plug the network connection cable directly to the node. A digital display on the tester will show the status of the node which can determine if the node is operating correctly. The unit can also be connected to a PC for more detailed diagnostics data.